If you treat your dog as a member of the family, learn how to build a whimsical dog house she'll be proud of. Check out these free DIY dog house plans HERE. Dogs have been man’s best friends for thousands of years. They have given us companionship, served as guards, helped with hunting and are integrated into our daily lives in a million ways. They deserve a little place to call their own! Dog houses have a long history – as long as the history of man and dog. Egyptian nobility housed their hounds in mud-brick kennels and had professional trainers to care for them. Dogs were part of ancient Greek, Chinese and Roman societies as status symbols and companions. In Europe in the Middle Ages, nobility maintained sizable kennels for packs of hunting dogs. By the 1800s, it was common for individual family dogs to have their own doghouses, with the classic pitched roof dog house coming into vogue. Today, as has been predominant through history, most DIY dog houses are projects that range from basic indoor or outdoor containers to elaborate fantasy structures. Most are fairly simple projects (though a couple of over-the-top dog house plans are included too), and can be attempted by anyone with basic building skills or the desire to learn them. Depending on the structure, most will only take a few hours to a few days to finish and will cost less than $100 in materials. Typically, you want your dog to have enough room to stand up, turn around, and lie down while stretched out completely. Keep it vented – airflow in hot weather will keep your dog from overheating, and avoid mold or ice formation in chilly or humid conditions. An open doorway or vents in the roof can do the trick (https://helmii.com). – Keep it off the ground. This will extend the life of the doghouse by helping prevent mold and rot, as well as making your dog more comfortable. A simple wood or concrete floor works well. – Protect it from the elements. Ensure your best friend is safe from water, wind and rain. That means tight seams, and overhangs for both vents and doorways. Now for the fun part: let your imagination roam free because the types, sizes, and styles of how to build a dog house are almost endless. Here are just a few design possibilities (using free dog house plans) ranging from practical to whimsical. Let’s call this the dogahedron! It’s very easy to build and has an eye-catching angular, faceted appearance that looks great indoors or out. It requires just some lumber, a cordless drill and a saw! Find the details at Homemade Modern. This is another project that looks amazing and takes very little in the way of serious carpentry skills. Starting with a basic wooden wine barrel, cut a hole in the top, then clean and varnish it. Next thing you know, Fido is lounging in comfort. There’s a full tutorial here. Like the wine barrel bungalow, this recycles a handy staple item. If you have a few wooden pallets and fence posts, you can make a delightful doghouse. Finish it off with some bedding and a cute tent for a doggy paradise. The steps are at All Created. Since we’re talking about a cardboard dog house, it is obviously indoors only. However, it’s charming, makes great use of upcycled boxes, and is a great rainy day project with the kids. Start with a closed box and some scissors, then just have fun. Add paint and perhaps even a mini yard! Find out how at Upcycle Art. If you want to create a more private, permanent place in your home for your dog, and live in a home with stairs, this is the one for you. Think through where you want your door so you only cut one hole in the wall. Keep in mind that if you do any construction that cuts out studs in your walls, make sure you reinforce them. Add a door, gate or curtain for a little poochy privacy. Therodimels has how. Let your dog enjoying camping year round using just some basic plywood and aluminum flashing. Make sure to laminate with glue and seal for durability, and add paint for charm. The Bark has a tutorial. This Dr. Seussian crooked doghouse is both whimsical and practical. The trick to making the wonky angles work is to mark your boards very clearly and keep them organized. Add an extra touch to the roof with shingles. See here for how. The first example of an A-frame doghouse uses an existing floor, like an outdoor deck, and doesn’t require your to build a base. Work in some insulation if you live in a chillier area to make sure it stays warm and snug. Learn more at Instructables. If you need a wood floor and like the A-frame style, this is the doghouse for you. You can use leftover fenceboards to make the floor, as well as to provide additional support. Mark and cut carefully, and it’s an easy project for even building beginners. 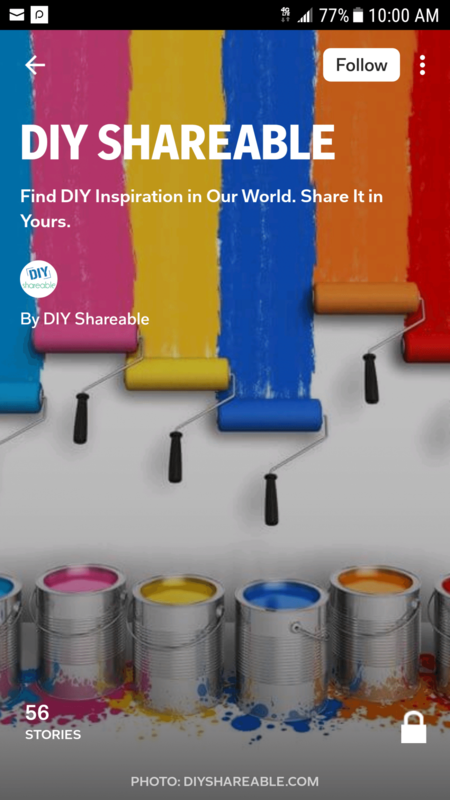 DIY Girl Cave will take you through it. A classic never goes out of style. With a few panels of plywood siding and a saw, you can have a fabulous, archetypal doghouse. Paint it for fun and character, then add a little landscaping around it for style. Also, if you’re in a chillier area, do consider doubling the thickness of the floor for added insulation. Find out more at Top Dog Tips. Consider this one step fancier than the basic house above. You can scale either of these very easily to your pooch. Again, if it’s an outdoor doghouse, make sure all the seams and flooring are waterproof to keep your best friend comfortable. Remove and Replace will show you how. If you live in a colder climate, this is worth the effort to make sure your dog is both safe and comfortable. Use 3” thick polystyrene sheets or rigid foam insulation between the wall studs, then cover with plywood sheets. Your pup will thank you all winter long. Get the plans at How To Specialist. File this under “beyond cute.” Using landscaping timbers, you can build a scaled-down log cabin fit for any pioneer. Cut, notch, and assemble, then add a roof with shingles or sealed wood. DIY Network contains a complete tutorial. This is fabulously creative and relatively straightforward. Add a tiny garden to any space with a green roofed doghouse. All you’ll need are the basic wood you’d use for any A-frame or classic doghouse, then some potting soil, plants and a little patience. Find full directions at Indyweek. This house takes a concept similar to the garden idea and works it into an upper sun deck and stairs. It’s an intermediate level project, so be prepared to take a little extra time and care. The results are spectacular, though, and will be the envy of ever four and two-legged visitor. Keep a doggy bed handy to pop on top during dry weather – your dogs will love this one! Discover how at Home Depot. Similar to the deck and garden setups, this is a ranch-style doghouse and intermediate level project. The roof in this particular version is actually removable, making it extra easy to clean. A tutorial is available at Sunset. Start with a wire frame, shape it, and then add concrete – simple! This unique take on a doghouse looks almost like an igloo. Ferro cement is strong, inexpensive and easy to build with. This doghouse will last through years, weather, earthquakes… it’s practically indestructible. Ensure that you seal it though to make it waterproof as ferro cement is quite porous. Walk through the steps at Instructables. Made by a man from Southeast Asia, this is amazing example of creativity and working with the materials and environment at hand. He used Ikea picture frames as windows that hold glass windows in the winter and are open for ventilation in the summer. Also, he added creepers within the bamboo for extra insulation and interest. Finally, he used bamboo legs to lift the whole structure up several inches to deal with heavy local rains. Appreciate the ingenuity that went into this at here. If you’re in a colder climate than Southeast Asia, you might want to consider adding a doghouse heater to your creation. You can heat most doghouses with a 100-watt floodlight, extension cord, lamp base and paint can. For the first few hours, keep a close eye on your doghouse (and leave it empty!) as there can be a slight risk of electrical fire if you don’t quite get it right the first time. Be brave, take a look at Instructables if you’re curious. Granted, this is not quite a do it yourself project – unless you are a professional architect and/or builder – but it’s fantastic and worth a look. Starting at $25,000 you can have a full custom-designed home built for your pup, complete with running water, air conditioning, light and heat. 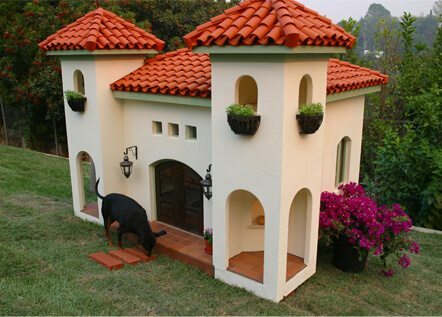 It can match your own full-size human house, or be specially designed just for your dog. Be amazed at Beyond The Crate. Ok, one more complete fantasy doghouse, this one starting at $30,000. This one was made for a Hollywood celebrity. Even the doors and windows are custom made for maximum beauty and functionality. Admire it at Beyond The Crate. – Think about your dog’s habits. Does your dog like to sit on top of things? Or roll around? You might want to build in some bedding, or make sure you have a flat roof. “Size of Sleeping Area Floor Space – With each inch of your dog’s height (measured from top of shoulder to ground) allow 36 square inches of floor space. For example, a dog 12 inches tall needs 432 square inches of floor space, or a floor area of 16″ by 27″ = 432 square inches. Height of Sleeping Area – Add 1 or 2 inches to your dog’s measurement when in a sitting position (from top of head to ground), in order to determine the ceiling height. For example, a dog 12 inches tall will have a sitting height of about 14 inches and the doghouse ceiling should be 15 or 16 inches high. – Take the time to build a floor, seal any seams, and finish in a way that keeps water out during rainy days. Always use some sort of foundation to keep the house off the ground, whether it’s built on your deck, a wood floor, or even concrete. A final word of caution: everything in your doghouse, and everything that comes in contact with your pet must be animal safe. Look for untreated plywood and softwood rather than pressure-treated; double check your paint and varnish, and give plenty of time for finishes to dry. Have a wonderful time building something you and your best friend will love for years to come!